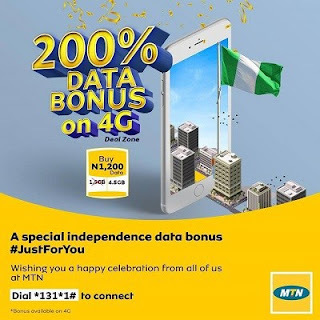 As a way to celebrate the country's Independence Day, MTN Nigeria is giving to its subscribers 200% data bonus on all data subscription today. This bonus is called "MTN Independence Data Bonus. 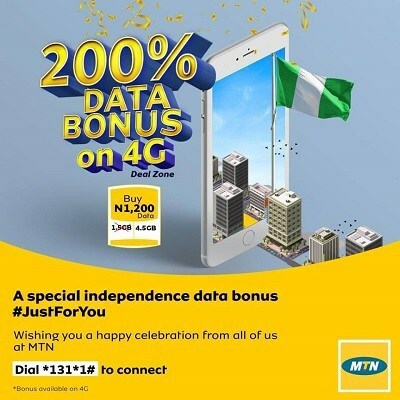 MTN took to its social media handle to announce this special independence bonus that gives you 200% bonus on all your data subscription today. According to MTN, “In celebrating Independence we’re giving you 200% bonus on all your data subscription today. So, go ahead browse, chat, call, stream, download and do more on the 4GLTE network." With this bonus, you get 4.5GB for N1200. You just can't afford to miss it. You should give it a try, but note that the data bonus is usable on phones with 4GLTE network. Dial *131*1# to connect. Happy new month and Independence Day celebration!